The UFC 123's pre-fight press conference will start this afternoon. Watch as fighters for the upcoming UFC event answer the questions of the press. Be there or be left out. Cagefighting fans cannot wait for UFC’s return to Michigan. The promotion starts the series of events with a pre-fight press conference and surely everyone wants to be there. Good thing is it is open to the general public. The pre-event press conference will be on Wednesday, 1 PM ET at the MGM Grant Detroit. The event takes place in the Grand Ballroom. Taking part in the said press conference are main event fighters Quinton “Rampage” Jackson and Lyoto Machida and co-main event participants Matt Hughes and B.J. Penn – all former UFC champions. UFC president Dana White and lightweight fighters Joe Lauzon and George Sotiropoulos will also be there to participate in the pre-event press conference. The event includes a Q&A session with the media. 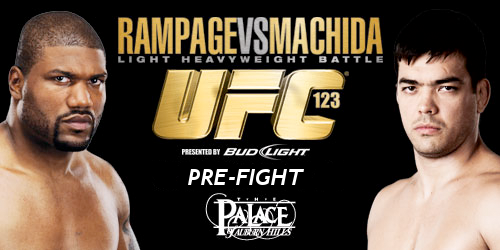 UFC 123 takes place this Saturday night at the Palace of Auburn Hills in suburban Detroit. This will mark the come back of the Ultimate Fighting championship to Michigan since UFC 9 last May 1996.